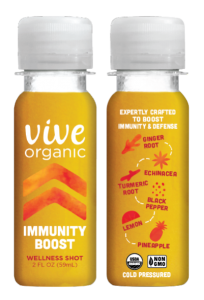 To make Vive Organic Wellness Shots, Vive worked with a team of doctors to create the perfect combination of leaves, roots, flowers, grasses, fruits and veggies that have the power to enhance quality of life. By cold-pressing ingredients, they deliver the freshest and most pure forms of natural wellness in one delicious single serving. All Vive ingredients are USDA Organic, Non-GMO and Kosher. The shots are never made with artificial colors or sweeteners – not even stevia, honey or sugar. At Vive, they believe that nature alone should determine the color and flavor of their Wellness Shots. The Vive Organic team is committed to making a positive impact on people’s lives by providing the freshest and most powerful ingredients.